I think the best way to empower women in law is to have compassion for the experience of being a female attorney and to keep that compassion at the forefront of everything that you – and the WBAI – do. 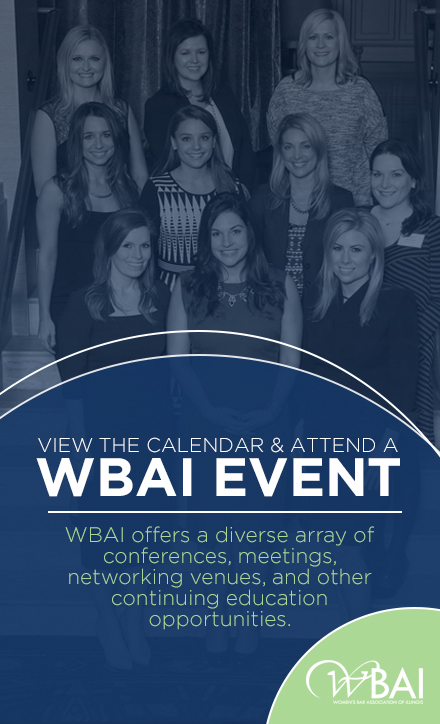 The WBAI is uniquely positioned to support women – whether it is lobbying for important policies, understanding that work and family come first and being supportive of women who prioritize both, supporting women’s career choices, and celebrating women’s achievements. Women regularly take on more; the WBAI, and female attorneys generally, can be there for each other when the rest of our lives are making demands. I am most looking forward to continuing my work for a growing organization. Until I moved to Chicago in 2010, I lived most of my life in the South. Somehow I am surviving Chicago winters!